1tr into the next 8ch (shoulder), 3tr into next ch, 1tr into the next 8ch (back). Turn. tr into top of 3ch. Turn. (85tr + 3ch) Fasten off. remaining tr, ss to top of 3ch on beginning of row. Turn. Rpt last row 14 more times, making 16 group rows in all. Fasten off. underarm where you divided for the armholes, 3ch, 1tr into side of tr, 1tr into each of next 22tr, 1tr into side of tr on opposite side of sleeve, ss to top of 3ch on beginning of row. Turn. (24tr + 3ch) Fasten off. 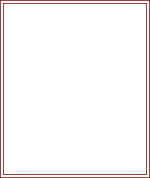 into next tr * rpt from * to * to last 5tr group, miss 2tr, 1tr into centre tr of 5tr group, miss remaining tr, ss to top of 3ch on beginning of row. Turn. Fasten off. Using 4.00mm hook, colour 1 and with RS facing, start at lower edge on right back edge, work 18dc evenly up right front to corner, 3dc into corner, 1dc into each tr around neck, 3dc into corner, work 18dc evenly down second back edge. Turn. 1dc into next 7dc, * rpt from * to * once more, 2ch, miss 1dc, 1dc into remaining dc. Turn. Next row - 1ch, 1dc into base of 1ch, 1dc into each dc and ch space to corner. Fasten off. Finishing - Sew in and tie off loose ends, sew on buttons to correspond with buttonholes. Decorate Yoke with pastel colour rosebuds. 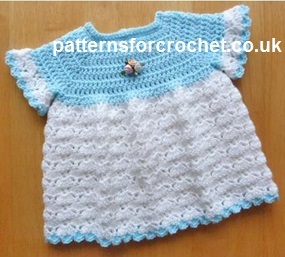 Hope you enjoy this Free Crochet Pattern for a Baby Dress.